Our school is located at 7091 Proctor Road Sarasota, FL 34241. Classes are held from 2:00 pm - 4:00 pm on Saturdays, and follow the Sarasota County calendar school year. Please see school dates on our calendar and our registration form for additional school information. Also, feel free to view our school brochure. Please see additional links on this page for general school information. Please contact our falculty or our Principal with any questions or comments. 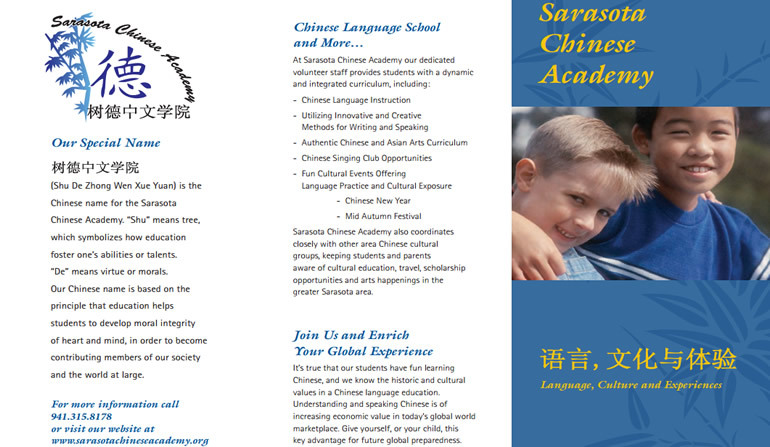 Sarasota Chinese Academy is very fortunate to have native Mandarin Chinese teachers. Text books used by our teachers are some of the same books used by teachers in China, through HanBan, China's Department of Education. Additionally, The Confucius Institute has donated Chinese language and culture books the The Sarasota Chinese Academy which are also used as a resource for students. Shu De Zhong Wen Xue Yuan is the Chinese name of The Sarasota Chinese Academy. "Shu" means tree, which symbolizes how education fosters one's ability or talent(s). "De" means virtue or morals. Our Chinese name was based on the principle that education helps students to develop moral integrity of heart and mind, in order to become contributing members of our society and world at large. Since its inception in 2006 the Sarasota Chinese Academy has grown in enrollment and community involvement. Our school is active through language classes and cultural events. Our school student body can range from approximately twenty to sixty students enrolled on a semester basis. We have teachers who teach pre-k through adult. 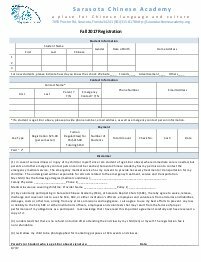 Click below for our fall 2017 registration form. 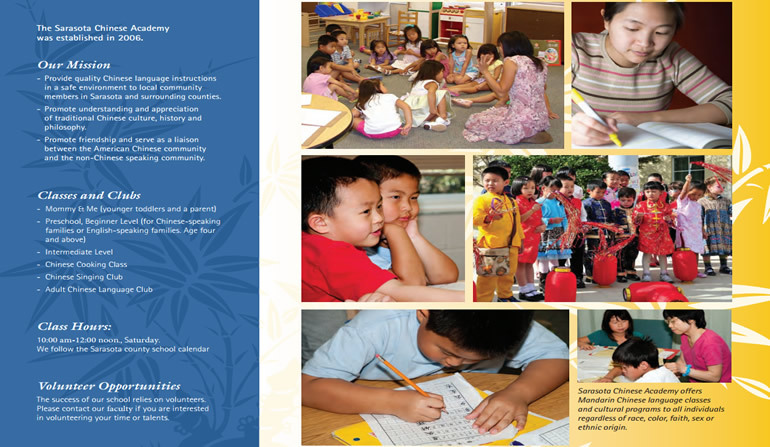 is a non-profit, cultural, and educational institution which offers Chinese language classes and cultural programs to families and individuals in the Sarasota-Bradenton area.